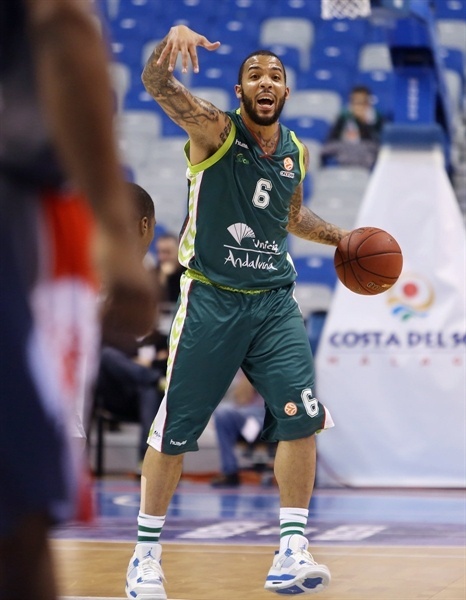 Unicaja Malaga had no problem whatsoever on Thursday night to defeat Elan Chalon at home by 86-62 in Group B. The win was what Unicaja needed to try to win the top spot in the group, but Maccabi Electra Tel Aviv also defeated Alba Berlin in the other group game, and therefore things stayes as they were with the Israeli team winning the group and Unicaja finishing seconds with a 8-2 record, just like Maccabi. 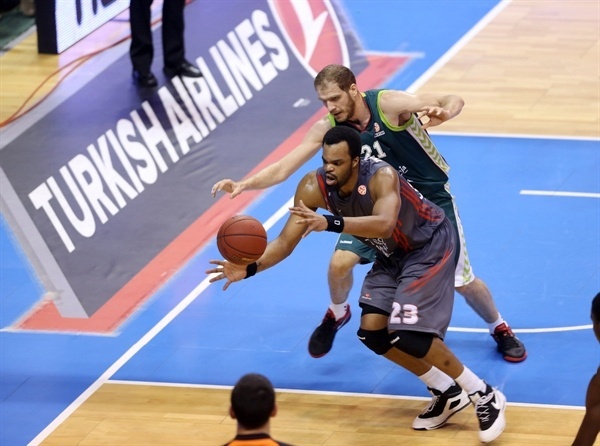 Chalon, who was already eliminated from the Top 16 race before the game, dropped to 3-7 to put an end to its Turkish Airlines Euroleague season. Unicaja will land on Top 16's Group E. Great defense allowed the hosts to run in offense and they soon built a big gap on the score that was never threatened by Chalon. A true basketball legend in Spain, Carlos Jimenez, also played his last minutes after coming back this season from retirement to help Unicaja temporarily. 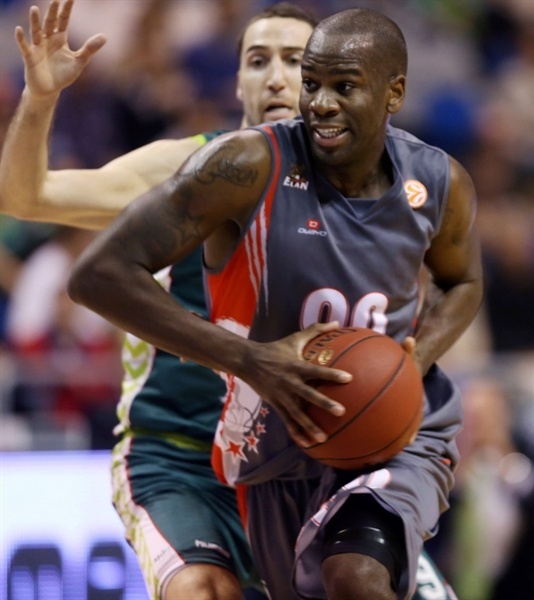 James Gist led the winners with 11 points, while Sergi Vidal and Luka Zoric had 10 each. For Chalon, Cedric Banks had 13 points anc Clint Capela contributed 12 plus 12 boards. The game started with a fast pace on both sides as Txemi Urtasun started up the counting with a three for Unicaja Malaga. Clint Capela slemmed it for Elan Chalon and the 5-2, but Unicaja's big men, especially Luka Zoric, were hurting the guests under the basket after fast transitions. 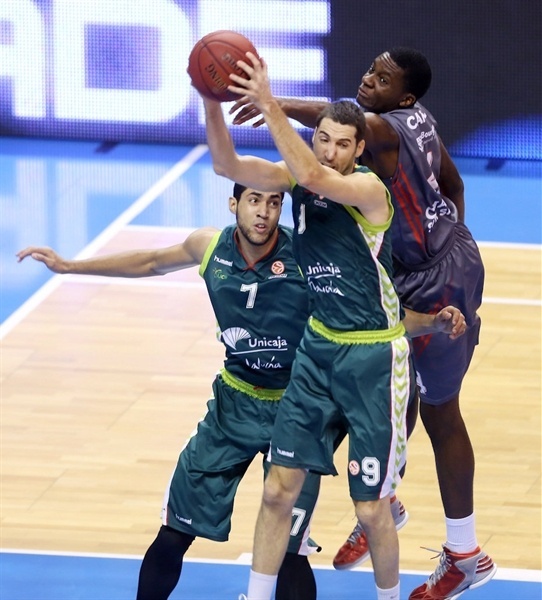 Zoric's sixth point arrived for the 13-5 Unicaja lead, and then Fran Vazquez slammed for his own fourth, 15-7. Chalon was trying to look for options, especially from the backcourt, but points came in scarce while Unicaja kept doing its thing inside to launch the margin into the double digits, 21-9 after Zoran Dragic's slam in transition. Jordan aboudou stopped the bleeding for the guests, who had only managed to attempt a total 5 shots up to that point and pulled 3 rebounds. Unicaja's defense was forcing the turnovers of Chalon and, on the other side, James Gist slammed it for a basket-plus-foul situation to make it 24-11 for Unicaja after 10 minutes. Jean Baptiste Adolphe Michel hit first for Chalon starting the second quarter, but Kosta Perovic soon added free throws to get Unicaja going and Gist soon blasted a three for the 29-13. Gist was becoming very active for the hosts on both ends of the court, and when Earl Calloway scored a new basket for 31-13, Elan Chalon called for a new timeout. On top of that, Kevin Houston was called for an unsportsmanlike foul and Calloway made the most of it with four more points of his own for 37-13. Cedric Banks finally shut the five-minute scoring drought of Chalon with a couple threes for 38-19. Young Luis Conde stepped on the court to make his Turkish Airlines Euroleague debut for Unicaja, as the hosts stepped on the gas a little more and soon lifted the score to 46-21 with fast transitions and fastbreaks after good defense. 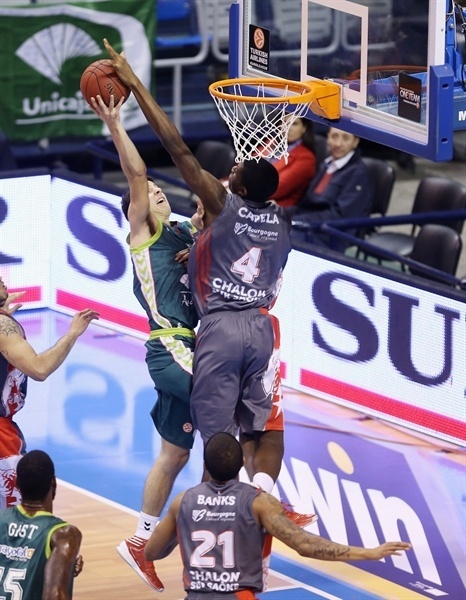 Capela found time to squeeze in a dunk to put an end to the first half with a 46-23 Unicaja edge. Gist opened the scoring in the third quarter with his bucket for Unicaja, but Blake Schilb replied fast with his two buckets and then Banks nailed a three for the 50-30. Dragic hit his own triple to put things back in place for Unicaja, and despite Schilb's waking up, the hosts managed to chain a 6-0 to stay way ahead. Chalon was not letting its guard go down and was still aggressive towards the basket, and therefore points kept coming because Unicaja was not as focused on the defensive end as in the first half. JBAM slammed inside but Calloway re-appeared to close the third quarter at 67-43. Cesar Augusto Lima opened the last quarter with a new Unicaja three, contested by a 0-6 burst of Elan Chalon capped by Capela. Lima scored again form the arc as the minutes went by. 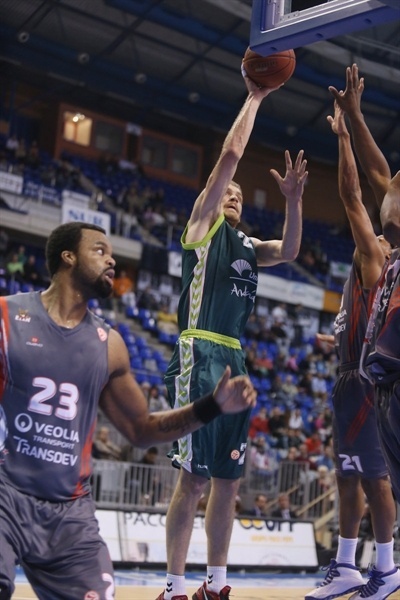 Unicaja's lead was never threatened despite the hosts taking it a little easier in the final minutes. Chalon was relentless and never gave up as Capela was particularly active in the paint, 77-51 with 5 minutes to go. With 2:06 minutes to go a special moment took place at the Martin Carpena Arena as Carlos Jimenez scored two free throws and went then to the bench for a standing ovation recognizing the career and commitment of this legend of Spanish basketball who retired after this game. He was substituted by the newest generation, Conde, who was back on the court. To celebrate, Sergi Vidal fed Gist for a monster alley-oop that brought the crowd to its feet for the second time in one minute. 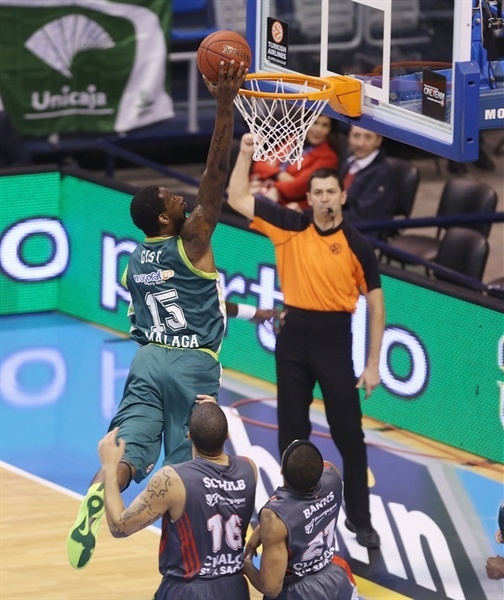 There was no doubt that Unicaja was putting an end to the Regular Season on a high note. "It was a complicated game because there was nothing at stake for neitherteam. We have been concentrated from the very beginning and it was a great way to pay back the bans that give us so much support. 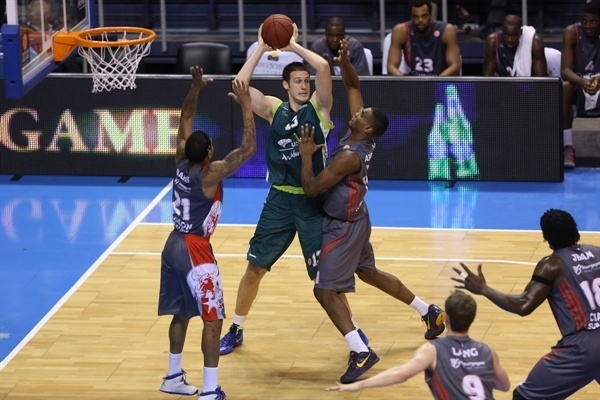 Next Monday my contract expires, and now I only one more game left in me with Unicaja. I don't think about it a lot however because it's something cirumstancial. People thank me for my effort and I am happy for the standing ovation they offered me. To me, basketball is a gift. I haven't talked with the club yet, we'll see what happens."